Tuesday • November 22 • 2011 Volume 78 • Number 47 INSIDE: Presorted Standard US Postage Paid Permit #32 ECRWSS Yankton, SD Bomgaars ? Sears ? Campbell’s Supply ? Menards ? Dining ? One In A VerMillion ? bp Broadcaster Press Postal Patron Local Since 1934 201 W. Cherry ? Vermillion, SD 57069 ? Phone: 605-624-4429 ? Fax: 605-624-2696 ? www.broadcasteronline.com HUGE A Good Hunt Starts Here! % Off 20 u Duck l Flambea Al coys Goose De & Bird Hunting Season Benelli Vinci Standar d Duck Decoys $ 99 12 gauge, 3” $100 Dakota Archery Gift Certificate with purchase $ 1299 99 29 Deer Hunting Season #69 Doe in Rut Lure $ 00 Off Buck Lure Starting at 4 $ 99 5 Pack Rack & Pack Rack Magnum $ 99 Starting at Predator Ameristep 3-D Poncho Mod #10114 Hunting “Ghillie Suit” Season Available in Snow Camo or Realtree 39 ONLY $ Starting at 9 $ 69 See Us On Facebook 99 Duke Live Traps $ 99 Starting at Leg Hold Traps 8 20 Electronic, Digital, High Definition Game Calls Features 40 different game calls 99 Trapping Season Whitetail Deer Urine $ 99 Mimic HD 74 $ doz. 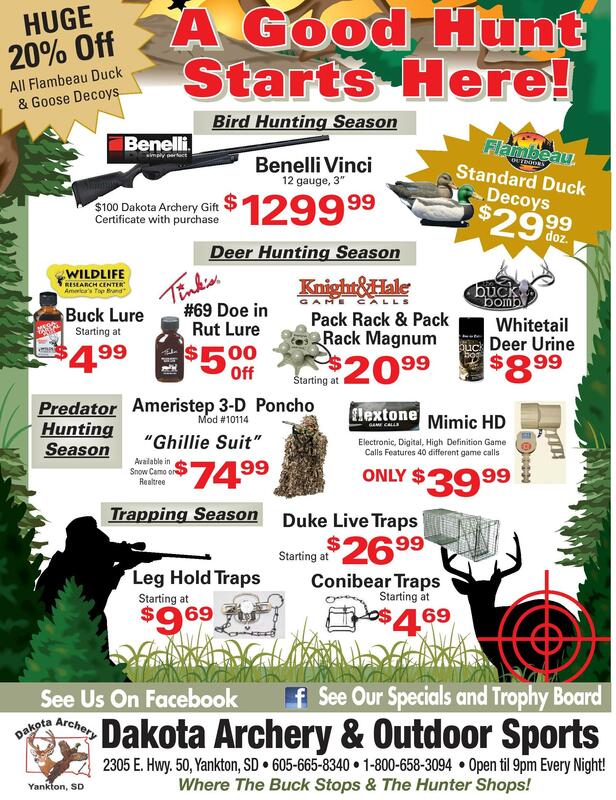 26 Conibear Traps Starting at 4 $ 69 See Our Specials and Trophy Board Dakota Archery & Outdoor Sports 2305 E. Hwy. 50, Yankton, SD • 605-665-8340 • 1-800-658-3094 • Open til 9pm Every Night! Where The Buck Stops & The Hunter Shops!